"There is no such thing as failure"
What separates a good idea from a revolutionary one? How can a small business grow into a global corporation? Alexander Görlach and Thore Barfuss asked Richard Branson to explain. The European: Do you today see an inflationary use of the terms “innovation” and “innovative”? Richard Branson: Joseph Schumpeter’s defines entrepreneurs as " innovators who use a process of shattering the status quo of the existing products and services, to set up new products, new services." Peter Drucker was onto something too when he made the following definition in 1964: "An entrepreneur searches for change, responds to it and exploits opportunities. Innovation is a specific tool of an entrepreneur hence an effective entrepreneur converts a source into a resource. With staggering youth unemployment figures today I believe we need to encourage the use of terms like innovation and innovative as entrepreneurship offers some hope and an alternative to the traditional career path. Over the years the nature of entrepreneurship has changed as new businesses have developed and the world has evolved. New innovative business people will keep coming along and changing the game all over again. I was inspired at a recent B Team gathering of young business leaders who have successfully built businesses that prioritize people, planet and profits. They are well on their way to building and spreading better business practices. Here at Virgin, we intend to keep changing the game for good too. Can you spell out the difference between a good idea and something that will truly be a game changer? A game changing idea is something that really stands out: It is not easy to start a company and to survive and thrive in the modern world. In fact, you’ve got to do something radically different to make a mark today. If you look back at the most successful businesses of the past 20 years – Microsoft, Google or Apple, they all played a part in shaking up their sector by doing something that hadn’t ever been done and by continually innovating. They are now among the dominant forces. If you create something that everybody who works for you is really proud of then you know you’re on to a game changer. Businesses generally consist of a group of people, and they are your biggest assets. Is concentrating on one idea/product – and on making it perfect – the right approach to innovation, or is it more about trial and error?In order to make an idea or product successful you need an element of trial and error in the early stages, after that you can concentrate on making the concept perfect. Most of all you need tons of belief – belief in yourself and the people around and you should never give up on your dreams. I think Virgin is considered innovative because we are not afraid to dream big and are constantly looking for new challenges. We are considered pioneers in many different industries based on our innovation, rather than the size of any of our companies. Great innovations were often driven by remarkable persons. From James Watt, to Henry Ford through to Steve Jobs. Is innovation possible without great personalities? Yes innovation is possible without great personalities but a strong personality helps shape the face of a business. I think the Virgin brand reflects my personality. It is passionate, determined, focused on its staff and customers and has remained very curious over the years. Even today, the Virgin brand is not a product like Coca Cola or Famous Grouse whisky, it’s an attitude and a way of life to many. That attitude is about giving customers a better time and better value in a fun way that embraces life and seeks to give the customers something new. All brands have a personality whether they like it or not. Some are good and warm and loved; others less so. But brands, ultimately, belong to the consumer and whilst a business can influence its brand by what it does and how it behaves, it is what the customer thinks at the end of the day that is the only important thing. What do those individuals have in common? Do they all have a rare gift, or do many people have the potential to be next Richard Branson? Dr. Muhammad Yunus said "All human beings are born as entrepreneurs. But unfortunately, many of us never had the opportunity to unwrap that part of our life, so it remains hidden.” In my experience, many young people have in them an entrepreneurial spirit and they display exceptional drive. But each of them needs support on their journey. Large enterprises and government can and must do more to help these young entrepreneurs. This means adapting policy and taking practical steps to ensure the opportunities are there for those brave enough to take them. It’s my strong belief that those with the power to help should be encouraged to do exactly that: to nurture talent, to provide advice and to provide investment where required. Increasingly we are hearing more about how big business needs to play its role in society for the greater good. We all have a role to play and it makes business sense. In fact, consumers demand that business be responsible. Creative destruction is often named as one key factor for innovation. Are most people too anxious to destroy? Most people are too anxious to destroy. The iPod effectively destroyed the selling of records. To the detriment of the music industry but for the benefit of the public. One can’t hold back to progress. Many people are also afraid of failure. Is not being afraid of failure the basic requirement for success? As an entrepreneur you have to learn very quickly that there’s no such thing as a failure! When something doesn’t go exactly to plan, money is tight or a business is struggling – see it as a challenge rather than a failure. Look outside the box and try and find a solution – you’ll be surprised how many great opportunities and possibilities arise when things look bad. You’ve just got to open your mind and not be afraid of taking risks. The amount of time people waste dwelling on failures rather than putting that energy into another project, always amazes me. A set back is never a bad experience; it is a learning curve and an opportunity to grow. Looking back on our history I don’t feel as though we’ve suffered too many failures. I believe that’s a result of our ability to adapt to changes quickly. We run our companies small, there is very little red tape and certainly no bureaucracy – we make decisions quickly and implement them – using before our competitors in the market have held there fifth meeting on the same issue. Regarding rising economies like India or China: Is innovation the key factor for Western economies if they want to compete? The best, most solid way out of a crisis in a changing market is through experiment and adaptation. Businesses surf the waves of changing circumstances, and I can’t offhand think of any industries whose best players are not constantly engaged in reinvention of one sort or another. Making changes and improvements is a natural part of business, and for sole traders and very small companies, the distinction between innovation and day-to-day delivery is barely noticeable and unimportant. It’s all just business, and creative, responsive, flexible business comes easier to you the smaller your operation. Which new invention has the greatest potential? What was the most innovative thing you have ever done? In the near future I plan to go explore the depths of the Oceans and travel to Space which I believe is an important development for the future of the science of space, the planet and the deep seas. 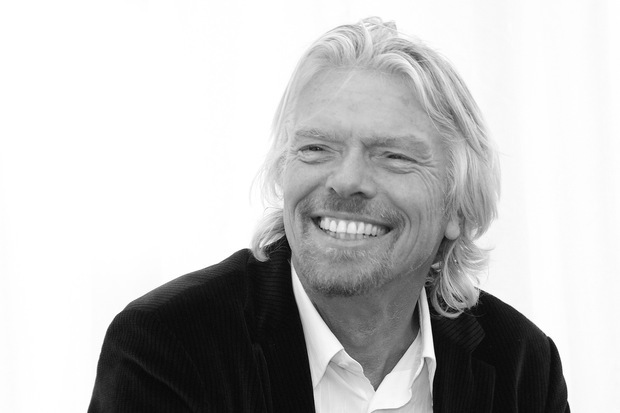 Richard Branson is a British entrepreneur, multi-billionaire, and the founder of “Virgin Records”. Since 1972, Branson has grown “Virgin” into a multi-billion dollar business empire that now includes Virgin Atlantic Airlines. His first business venture – as a sixteen-year old – was an opinion and interview magazine called “The Student”. Despite prominent guest authors like Jean-Paul Sartre and interviewees like Mick Jagger, it failed.